Dirty Coal Tour speakers being prevented from reaching the UCL Provost’s office to hand in letters of concern about the relationship between the college and mining company BHP Billiton. Photo: Jo Syz. During the recent Dirty Coal Tour, LMN hoped to arrange for our visitors from Colombia and Indonesia, who were here to raise their concerns about BHP Billiton, to meet representatives of University College London, which receives a great deal of money from the company for research. Not only were we not able to meet with UCL officials: they would not allow our visitors to hand in letters to the Provost’s office, and even the students’ union banned our public meeting on the premises. You can read about our disappointing day at http://londonminingnetwork.org/2014/10/lmn-bhp-and-ucl-2/. Well, some time has gone by and we’ve continued to be disappointed that UCL has not taken our visitors’ concerns as seriously as we think they ought to have done. In another blog, we’ll say something more about the problems with student union officials, but for now, here is the correspondence (such as it is) between London Mining Network and UCL – with a little commentary! On Thursday 23 October, London Mining Network will be hosting visits by representatives of communities affected by BHP Billiton’s coal operations or proposed operations in Colombia and Indonesia. They will be attending the BHP Billiton plc AGM that morning to express their concerns to the Board and shareholders. Given UCL’s close relationship with BHP Billiton, would it be possible for our visitors to meet with you or with other representatives of the UCL Provost’s office and the UCL Council that afternoon, to explain their concerns also to you? The next day I sent a letter to Dame DeAnne Julius, President of UCL Council, setting out some of our concerns about UCL’s relationship with BHP Billiton. I am writing on behalf of London Mining Network to express concern about UCL’s relationship with mining company BHP Billiton and I ask that this letter be circulated to all members of Council and relevant Vice-Provosts in time for the next Council meeting. I ask that the concerns raised be discussed in that meeting. London Mining Network has worked for years in support of communities affected by the operations of BHP Billiton. On Thursday 23 October, we shall be hosting visitors from Colombia (affected by the company’s part-owned Cerrejon coal mine) and Indonesia (working to stop the company from constructing a new coal complex in some of the last remnants of primary rainforest in Central Kalimantan). In a separate communication, I have asked whether it would be possible for them to meet with you on that day. Letters from our visitors, summarising their concerns, will be sent in the near future. We are concerned that UCL’s acceptance of funding by BHP Billiton helps to give the company a legitimacy which we do not believe it currently deserves and that the relationship may undermine UCL’s Charter. Specifically, we are concerned that UCL Australia may be functioning as a policy lobby group for energy and mining companies and that this may be at odds with Article 3 (Objects of the College) and Article 25 (What could be called “The benevolence principle”) of UCL’s Charter. We believe that accepting funding from a company which is so heavily involved in coal mining conflicts with UCL’s own Environmental Strategy, both because of its contribution to destructive climate change and because of the more immediate environmental and social impacts of coal mining. Construction and expansion of the Cerrejon opencast coal mine in Colombia has led to the forced removal and dispersal of a number of rural communities, violation of Indigenous Wayuu cultural values and sacred sites and loss of livelihood among small-scale farmers. A summary of our concerns is included in the short report I wrote about my recent visit to the area, published on our website at http://londonminingnetwork.org/2014/06/cerrejon-coal-colombia-an-abusive-marriage-full-of-machismo/. The potential impacts of BHP Billiton’s Indomet project in Indonesia are explained in a Jakarta Post report at http://www.thejakartapost.com/news/2014/05/20/a-hunger-coal-threatens-the-heart-borneo.html and in short videos at http://londonminingnetwork.org/2013/11/banking-while-borneo-burns-top-five-banks-fuelling-climate-change/. UCL’s relationship with a company that is receiving so much criticism for the ecological, social and climate impacts of its operations must surely have a negative effect on UCL’s reputation. 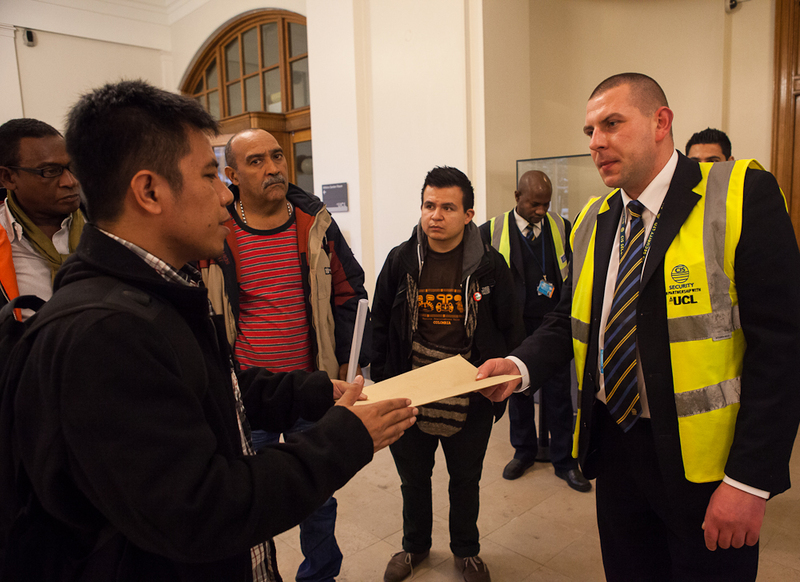 We ask that the Council consider the representations which will be made by our Colombian and Indonesian visitors when they are here and that it terminate UCL’s unfortunate relationship with BHP Billiton at the earliest possible opportunity. Thank you for your email requesting that Professor Arthur, Dame DeAnne and members of UCL Council meet with representatives from communities affected by BHP Billiton on the afternoon of Thursday 23rd October. I am writing to advise that this will not be possible. Please accept UCL’s apologies. Thank you for letting me know. I realise that my request for a meeting was made at very short notice and I am grateful to the Council for considering it. Will a response be given to the other matters raised in my letter? Our visitors have also written letters, which I attach in English translation (the originals having been written in Spanish and Bahasa Indonesia), which they would like brought to the attention of the Provost, President and Council ready for the Council meeting on Monday. I hope this will be possible. Our visitors would like to deliver signed copies of their letters on Thursday afternoon, 23 October. Might it be possible for a representative of the Provost, President and Council to receive the letters from them at some time between 3pm and 5pm? Nick McGhee, UCL Council Secretary, emailed me that day to let me know that LMN’s letter to Dame DeAnne Julius had been made available on Council’s Sharepoint site. The two letters from our visitors were also made available to Council members. The Colombian letter is from FECODEMIGUA, the Federation of Communities Displaced by Mining in La Guajira (the most northerly province of Colombia) and refers to the Cerrejon coal mine, which is jointly owned by BHP Billiton, Anglo American and Glencore Xstrata – all companies listed on the London Stock Exchange. What follows is an English translation rather than the Spanish original. We are writing to you in the hope that you may understand our perspective on the accusations we are making against Cerrejón Coal, the company which is extracting coal through open cast mining in our country, and has left immense problems in its wake for the communities existing in these territories. We have summarized these accusations in the following points. All the communities affiliated with FECODEMIGUA were located in the original 35,000 hectares of land acquired by the Carbocol-Intercor Association (that is, the Colombian State and Exxon Mobil). Carried out in bad faith, this acquisition was rooted in direct plunder, trickery, false representations of paradise, extortion (the State is the owner of the subsoil, that is, the earth), blackmail, mortgages (contracts for the occupation of land), ignorance, naivete, expropriation etc; and the worst of these treacherous and deceitful practices is that they have been lauded as exemplary and continue to be followed by the Colombian State to displace small-scale farmers in the interests of transnational capital and to the detriment of the most humble people of our country, the owners and keepers of the land. The State handed over title to these lands to the mine, controlled by Intercor, the operating company of the coal exploitation project, violating the political constitution of Colombia and the applicable legal norms, such as the then Mining Code, Decree 1275 of 1961, the Civil Code and the Commercial Code. Here there was no Contract of Sale and Purchase, just an imposition by Intercor, and it was a discriminatory process, in as much as the operator prepared written documents for the presumed owners of farms or plots, who were in many cases deprived of the title to those lands. All the communities held collective land where animals were raised, such as oxen, goats, horses and poultry, among others. These lands were shared in a peaceful and respectful way among all those with roots in each village and those passing through. The company’s actions led to the destruction of the social fabric, the loss of ancestral or traditional medicine, the destruction and disappearance of sacred sites, such as cemeteries, rivers, lakes and springs of living and pure water. Places of devotion such as churches and other such places were also destroyed and their saints, such as those of Manantial and Tabaco, are even today held by the national police, the agent of the expropriation of land in these places. In all these communities, cultures have been exterminated, heritage has been lost and every day we are being undermined by the physical loss of the older generation and, powerless, we see their hope of having their own land, where they can affirm, ‘this is my new land’, and they continue to dream, and we hope they can achieve this dream, this ideal. They dream of having a healthy environment, as it was in their villages which have disappeared, and they all demand and cry out for social justice, protected by the universal principles of equality. We can affirm, with all the power of truth, that there was no prior consultation, that is to say, no one was asked if they wanted to sell their land. This due process was violated by the Colombian State in the interests of foreign capital. This sudden move led to our forced exile and separation. It was violent and we received no help from anybody whose responsibility it was to defend our rights. We draw attention to and we reject all the posturing propaganda by Cerrejón when they affirm that hey “work to the highest international standards regarding matters of the environment”. It is a lie, it is false: every day they waste 17 million litres of water within the 15 thousand hectares of land from which they have torn away the tropical dry forest and we’ve been left with a continuous downpour of coal dust 24 hours a day, dust which contaminates and which contributes to the worsening of climate change in the world. They ought to say how many kilogrammes of dynamite they use every day to extract the coal, it must be tonnes each day, and all this has severely negative consequences for the well-being of the communities in the municipalities of Albania, Hatonuevo and Barrancas. Principally, they’re destroying planet earth’s ozone layer. The first community to be re-settled was Oreganal. It was a shame that the resettlement was not a universal right offered to all the residents and neighbours of the area: only a small minority received the benefits offered, if they can be called benefits, as the lack of collective land received had a fatal consequence, changing the livelihoods of the residents from traditional farmers to city dwellers. This resulted in a period of uncertainty and destabilization of their traditional ways of life and in some cases depression led people to their grave. What is happening is a criminal fraud, a deception, and it is happening to the residents of Roche, Chancleta, Patilla, Tamaquito II and, right now, Las Casitas. We have no legal tools with which to halt the Colombian Government’s ‘Mining Locomotive’. The only weapon we possess is that of our own efforts, and we are constantly forced to make use of them, but our people are tired of hearing empty words from the Cerrejon company and the Colombian State. They have to either exterminate us or relocate us, but if we are to be relocated it must be to a place that provides for our basic needs and our overall well-being; the time for a decision is fast approaching. We declare and affirm that before the extraction of coal we were much happier and we lived in peace. Development has brought with it many inconsistencies to our lives, destruction and individualism; foreign and confusing thoughts now afflict the minds of the communities affected by the Cerrejón mine. We shall not cry over the earth that has been lost: we want to live, but to live with social justice and a healthy environment. The communities of Manantial, Caracolí, Zarahita, El Descanso, Oreganal, Palmarito, Tabaco, Roche, Chancleta, Patilla, Barrancón, Provincial, Las Mulas, El Espinal and Las Casitas can be said to be ancestral communities which occupied these lands many generations before the coal mines were discovered at El Cerrejón in 1875. We therefore demand that the State and Cerrejón recognise our ancestral RIGHTS in each and every one of the communities destroyed and displaced by the coal mining, with all the integral well-being which our land supplied to us previously. Today the situation is critical in various respects in the lives of the those who make up Fecodemigua, in the Indigenous Reservations and others who live around the mine, with the appearance of strange diseases around us, different types of cancers, depression, heart-attacks, aneurysms, sudden respiratory death, silicosis, pneumoconiosis and many other diseases not currently classified by science. The Constitution of 1863, that of the United States of Colombia, recognised the right of the country ‘s inhabitants to the subsoil; for example, it recognised the written titles of COMUNEROS, who were paid ROYALTIES for coal mining. The Constitution of 1886, which amended certain aspects of the former Constitution, recognised the rights acquired by the citizens of the nation and concluded that certain forms of ancestral rights were legitimate, but these have now been removed, reduced by the new Constitution of 1991. Some of the rights taken from us included our collective rights, the rights of use, occupation and possession of land, the right to common use of public spaces, social welfare, customs and traditional rights which included mechanisms for the resolution of disputes between residents, the word of our elders, the use of oral rather than written forms of communication, decision-making in conflicts and the judgement or punishment of residents, consultation with holders of traditional medicinal knowledge when faced by disease, the medical use of plants, the use of water sources, the manner of sowing seed and many other rights which our elders ensured as they possessed the authority to do so. All our decisions were preceded by consultation. All this cultural heritage is being lost or has been lost already, not for the welfare of local people but for the owners of big business at the expense of the rights of the real and only owners, the African and Indigenous peoples settled in the territories occupied by the Cerrejón mine in La Guajira. Today we are faced by a collective PANIC in our communities because of the devastation begun by the coal mining company in the communities of Roche, Chancleta, Patilla and Las Casitas, and as a result of the EXPROPRIATION undertaken by the Municipal Government, motivated or influenced by Cerrejón. Prior Consultations are being carried out by the Office of the Secretary of the Municipal Government, without the authority to do this kind of administrative act, which therefore lacks legal validity. The inhabitants of these areas are suffering appalling harassment without any human consideration. We denounce this outrageous situation and seek your support to stop this barbarity being committed by the Government of Colombia on behalf of transnational capital. Another collective panic is the constant earthquakes in the Region; this year we were witness to more than 28 earthquakes between the Regions of Cesar and La Guajira. Finally, and on the basis of all that we have described above, we seek the solidarity of University College London for all the communities who are today victims of the coal mining at Cerrejón, which is owned by BHP BILLITON, ANGLO AMERICAN and XSTRATA. 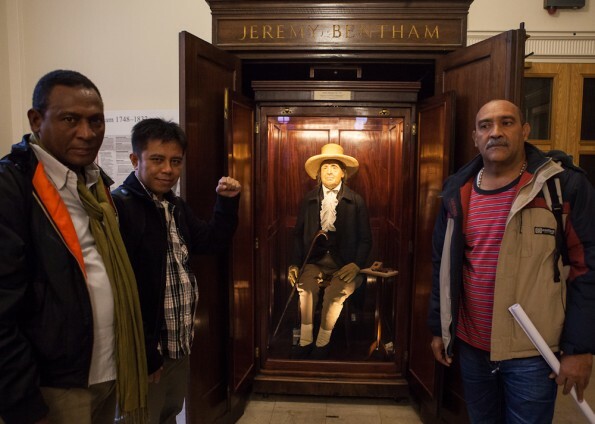 We wish to extend this request for support to COLOMBIA SOLIDARITY CAMPAIGN, LONDON MINING NETWORK, WORLD DEVELOPMENT MOVEMENT and WAR ON WANT, and to all men and women of good will towards those of us who have been disinherited and forgotten by the power of big business. Our address is: Calle 13, No. 25-21, Maicao, La Guajira. The letter below from Walhi, Friends of the Earth Indonesia, is a translation of the original Bahasa Indonesian. We are writing to express concern about the funding of UCL by BHP Billiton. The Dayak Siang people live in a traditional way, based on agroforestry. The forest is an important part of their life. It provides fertility to the soil, it is a source of water, and a hunting ground. Cutting off the indigenous Dayak Siang people’s access to the forest threatens their existence. The mining multinational BHP, “in cooperation” with the government in 2005 forced the indigenous communities to leave the forests they were managing. As many as 72 families were forced to accept compensation of Rp100 (about half a penny in UK money) per square meter for the forests that they managed. The police threatened to criminalise the community for forest destruction if they didn’t accept the compensation. Two community leaders were detained at the police station for 14 days because they didn’t want to accept this unjust compensation. In 2013 Indonesia’s Constitutional Court issued a ruling that indigenous peoples’ forests (hutan adat) are no longer state forests. This means that indigenous peoples have full authority over their forest territories. And based on Mining Law No.4 of 2009, mining companies with coal contracts of work must conduct renegotiations with the government, including on the extent of their concession areas. BHP is one of those companies. Will BHP release the forest area formerly managed by the Dayak Siang people in these renegotiations? The proliferation of coal mining activities in Murung Raya District has caused a deterioration in the river quality. Residents are reporting that they are suffering from itchy skin every time they bathe in the river. This is especially so in the rainy season. This never happened before mining came to the Murung Raya forest area. If BHP continues to the production stage, the degradation of rivers such as the Maruwai and Laung Rivers will get worse. One measure that would stop the destruction becoming worse is to cancel plans to mine coal in Murung Raya District, and to work with the local and national governments to re-establish this area as a protected forest or an indigenous people’s forest. Central Kalimantan is a REDD+ province (Reducing Emissions from Deforestation and Forest Degradation), as proclaimed by the Indonesian government and supported by international parties. Going ahead with coal mining in the Murung Raya forest area in Central Kalimantan, makes this emissions reduction programme a total failure. And this failure involves international parties such as BHP. BHP’s activities will also threaten the biodiversity in the tropical forests of Murung Raya. As a result, we are asking BHP to reconsider its plan to mine coal in Murung Raya, Central Kalimantan. We also urge UCL to decline further funding from BHP Billiton. I am writing to let you know that the letters you submitted were made available to members of Council. If the donation from the BHP Billiton foundation is renewed, it will be subject to scrutiny by a Gift Acceptance Committee as part of our routine processes for managing donations, and the Committee will take a view on ethical and other matters at that point, including the issues raised in your correspondence. Well, I suppose this is progress of a sort. But I’d have thought that the issues raised by our visitors warranted more than this rather cool, procedural response. I’d have hoped that there might have been a little more understanding, a little more human warmth and sympathy, a little solidarity with the oppressed. But perhaps I am too sentimental. I also thought it was, frankly, rather impolite to treat our visitors the way UCL treated them. They were cold-shouldered. What would Jeremy Bentham think, I wonder?